We managed to fill a whole episode with some odds and ends and we had a lot of fun doing it! Give us a call and let us know how you can tell when you've played too much ASL. Do that, and you will be entered into our contest to win some fantastical Advanced Squad Leader products. Start you're sentence with "You know you've played too much ASL when.....". Example: "You know you've played too much ASL when you view the landscape out the window as hexes of terrain." Box Art Review makes an appearance in this episode with a look at Operation Veritable and Operation Watchtower from MMP. We received a package in the mail the other day. 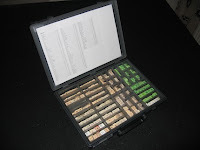 "In the box" was a Raaco storage tray system that we dug into, and examined, just to bring you a review. Thanks to Andreas at Trojan Games. What are you waiting for? Hit the listen now button! 32:00 What's in the Box? How do you brighten the video? I couldn't even see the films you were showing as a kid. The sound was excellent! I would like to ask you to please consider intrerviewing Tom Moring the designer of Valor of the Guards in the future (soon the better). For me VotG is one of the best ASL historical modules ever published, right up there with Red Barricades. He is currently working on Solitaire rules (Campaigns and scenarios) for VotG, I would like to hear him talk about that project as well. Keep the good work guys, been listening your show since episode #1. Can you add target="_blank" to your Show Links? Nothing worse than clicking one and having the show stop and get redirected. What's with all the nonsensical tweets and what is a PASSAL? PAASL is the acronym for the Palatine Area Advanced Squad Leaders club. ASL has it's own lingo and you need to know to understand everything. We will try to be more clear in the future. Thanks for clarifying. But how do you write an AAR in a tweet of 10 words and make it even close to sounding logical. At first I thought it was just a joke. I do however like the useful links that are tweeted.